Kiryas Joel, NY - A bill signed into law today by Governor Andrew Cuomo has bumped up the timetable for the official creation the Town of Palm Tree, which will be officially created a full year earlier than originally scheduled. 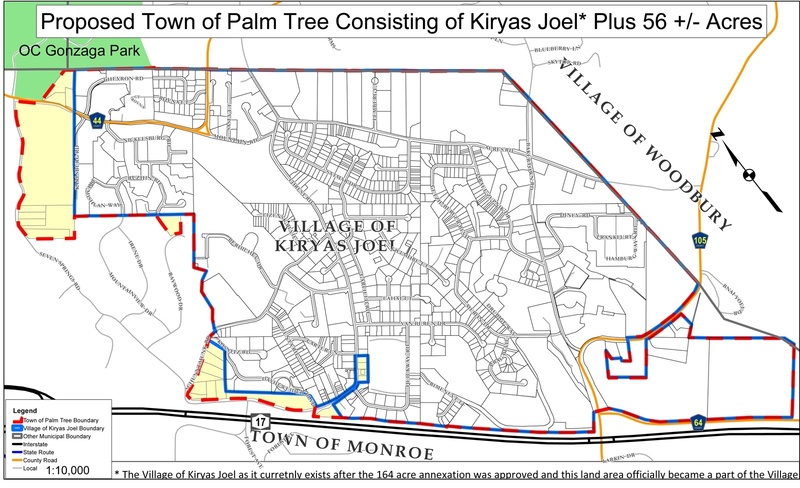 As previously reported on VIN News, voters approved a proposal last November to remove the Village of Kiryas Joel from the Town of Monroe, spinning it into the Town of Palm Tree in an effort to end years of tension in the area. The new town would include the Village of Kiryas Joel plus an additional 56 acres that are currently located in the Town of Monroe. While Palm Tree was officially slated for creation on January 1st 2020, a bill sponsored by Senator Bill Larkin and Assemblyman James Skoufis moved the process ahead by a full calendar year. After clearing the Senate unanimously on June 4th, the bill passed the Assembly on June 14th, receiving a single dissenting vote from Assemblyman Kieran Michael Lalor of Fishkill. The legislation was signed Monday morning by the governor, setting the countdown clock in motion towards the creation of the Town of Palm Tree on January 1st, 2019. The new boundaries of the Kiryas Joel Union Free School District will not take effect until July 1st, 2019. Fast tracking the town’s creation was a win-win situation for all, explained Kiryas Joel’s government relations coordinator Ari Felberman, with both the Village of Kiryas Joel and the Town of Monroe asking for the process to be expedited. “It was time to move on with our lives and when the Town of Monroe requested a home rule to begin the process a year earlier, the Assembly and the Senate were both on board,” Felberman told VIN News. With just 183 days left until the Town of Palm Tree becomes a reality, preparations are already underway to create the local government. Residents will be electing a town supervisor and members of the town board in the November general election, which means that candidates need to start collecting signatures for their petitions immediately, explained Felberman. “Time was, therefore, of the essence,” said Felberman. Village administrator Gedalye Szegedin credited Governor Cuomo for his swift action on the bill. Szegedin is hopeful that the formation of the new town will end years of lawsuits and hostility and create a sense of peaceful coexistence in the area. “Today we have finally achieved that goal and have shown that diplomacy and compromise product better results than acrimony and division,” said Szegedin. I wonder how much $ Cuomo will get? So what's going to be with the Old Name "Kiryas Yoel". ???? Is the New Name replacing the old. ?????????????????? I can point to Town after Town in the greater NYC area with all of the qualities you mention. Its not a contradiction. You can have them and not be the poorest either. By describing those who decry abuse as vermin,you ARE in fact,condoning abuse. Then,to make matters worse you follow the word abuse with yada,yada,yada. How cold,insensitive and cruel can you get? Sorry you misunderstood my intent, I was directing my comments to those who, whenever someone mentions the good that is to be found in KJ, they wil always use the abuse card, but Chas V'sholum I did not meant to minimize the issue of abuse, only those who abuses the issue of abuse.